Time to spread some DIY holiday cheer for the special people who make your school truly amazing! Here are some great holiday gifts that you can make without breaking the bank. Calm-Down Coloring Printables: Coloring can be really calming. Print out a few of these sheets and make a coloring book for someone special. Add some colored pencils or crayons with a nice ribbon! DIY Scented Heating Pads: Who couldn’t use some relaxation after a long day of teaching? Using some socks, beans, and scented oil, you can make a cozy gift for your favorite colleague. Homemade Spa Kit: Fancy lotions, scrubs, and potions don’t have to cost a fortune. You can make delicious and affordable spa treats at home and package them in adorable mason jars. Printable Self-Care Journal: Print up to 100 pages of free self-care worksheets and journal pages, bind them together with clips, string, or a binder ring, and design a custom-made cover for your recipient. Bake-at-Home Kit: A simple pot holder with a whisk and a tasty baking mix makes a fun present. Any holiday-themed oven glove will do! Ramp it up by including your favorite pastry or pie recipe. Caramel Apple Treats: Whip up a large batch of caramel, fill some mason jars, and grab a few apples. These adorable treats make a yummy holiday gift. Classroom Emergency Stash: Most teachers have an emergency candy stash in their desk or classroom somewhere. Help your favorite coworker prepare for the new year by building a candy stash kit! Share Your Favorite Soup Recipe: Many teachers crave quick, easy meals. Put the dry ingredients for your favorite soup into a mason jar. Top it off with a festive bow and a note. Bedazzled Binder Clips: Take some regular binder clips and jazz them up with glitter or printable clip labels, making an everyday office supply way better. Custom Teacher Tote Bags: Every teacher needs a great tote bag. Impress your coworkers with these super-easy personalized totes — using doilies and some fabric paint. Personalized Desktop Post-It Holder: Get an inexpensive plastic frame, fill it with a personalized image or your coworker’s name, stick on a pad of post-it notes and voila! Teacher Clipboard: Turn a boring, brown clipboard into something fun and personal. It’s easy and the possibilities are endless. Teacher Stamp Gift Box: Who doesn’t love using stamps when grading papers? With just a few materials, you can create a useful, personalized item. A Day in Your Shoes: Running a school is tiring! Take a pair of simple white sneakers (like Keds) and jazz ’em up to thank your principal. DIY Holiday or Classroom Ornament: You don’t have to celebrate Christmas to appreciate this decorative gift. Fill a plastic craft store ornament with crayons, pencil pieces, candy or confetti. Paint your principal’s name on it and attach a colorful ribbon. The “It’s Worth It” Keepsake Box: Being a school leader can be tough. This thoughtful, homemade gift provides your leader with a box or folder that they can fill with positive reminders of why they work in education. Accompany the box/folder with this “It’s Worth It” poem. Thank You For Helping Me Grow: Paint any planter pot, add a plant, and paint a message of gratitude or inspiration that your principal will see each day in their office. 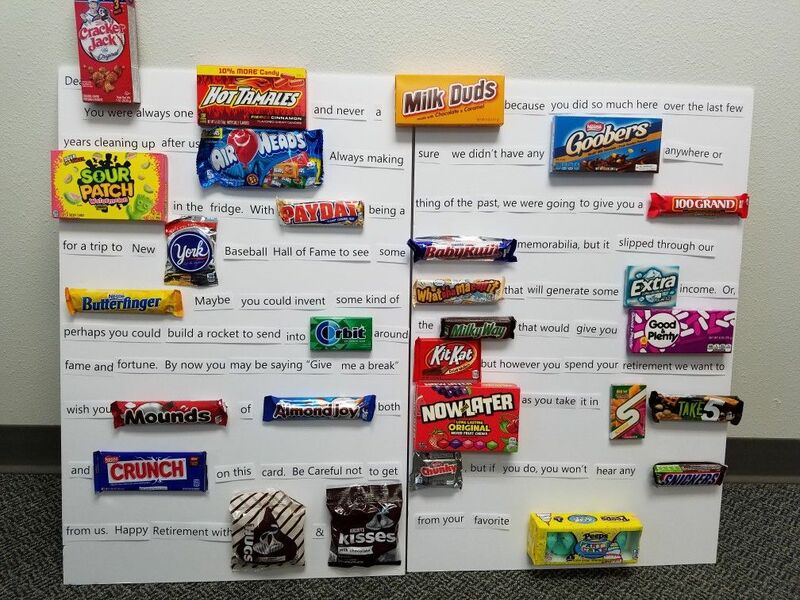 A Creatively Sweet Poster: The custodial staff often works long hours, even after everyone has gone home. Surprise them with an after-hours poster full of goodies. A Paint Can Full of Love: Fill an empty paint can from a craft store with treats and write your colleague’s name on the can. Fill it with thank you notes for a job well done. Lifesaver Message of Thanks: This sweet treat only takes a few minutes to make but you can add a personalized note and give one to each member of your school’s maintenance crew, thanking them for all the times they’ve helped you and your colleagues. Chocolate Prescription: Chocolate is medicinal, right? Get crafty and give your school nurse a laugh with some “prescription” chocolate hugs. Sharing Gratitude: Show your school nurse how much everyone appreciates them by wrapping their office door. Make it extra special by asking students and staff to write messages on it. You’re Da Balm: Stick a little lip balm on a custom printed card and you’ve got a cute gift for your school nurse. Gratitude Jars: Why not keep the gratitude flowing? Create a gratitude jar for the teacher’s lounge or use it amongst your closest work friends. Regularly add notes to the jar about what you’re thankful for and read the entries when things get tough. It’s sure to brighten your day and boost staff morale.